The soprano, Ludmila Hadjieva, was born Sept. 26, 1947 near Veliko Turnovo. Her debut was singing the title role in the opera Iolanta by Tchaikovsky in November 1975 with the Burgas Opera. International appearances took her to Paris, Vienna, Greece, Switzerland and the Eastern Block countries. She has been a regular member of the Sofia National Opera. In addition to her opera activities, Hadjieva has achieved important success in the field of chamber music. She has regularly given concerts performing the songs of Mozart, Schumann, Schubert, Brahms, Britten as well as music of the Russian, French and Bulgarian composers. Her husband was the famous composer Parashkev Hadjiev and performed and recorded many of his compositions. 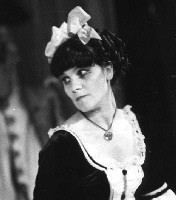 Major roles in her career included Butterfly, Mimi, Liu, Nedda, Michaela, Pamina, Fiordiligi and Lelo in the Pearl Fishers. Hadjev: Maria Desislava "Desislava's Aria"